Most people hope to age in the same homes and communities where they have lived the rest of their lives. However, suburban communities of single family homes often leave residents living isolated lives in environments hazardous to their changing bodies. In Montgomery County, Maryland, a County employee developed an innovative collaboration, the Life-Long Homes Collaboration, with other organizations to increase both the safety of low income older residents and their connection to the community. Through an organic process that included both local organizations (aging-in-place “villages” and a community college), and national organizations with a local presence (Habitat for Humanity, Rebuilding Together, Seventh Day Adventist Church), the County’s village coordinator facilitated repairs, weatherization and modifications to thirty homes between 2016 and 2018 and ongoing social support to their owners. The benefit of the Life-Long Homes coalition (LLHC) went beyond the aging residents it served. As a result of this collaboration, participating organizations learned how to break down silos, communicate and coordinate effectively, streamline work processes, and engage community residents, aging, disabled, students, volunteers and professional staff. Montgomery College and Seventh Day Adventist contributed to the intergenerational nature of this practice, connecting young adults to lower-income older adults through learning and service. How collaboration worked: The coalition offers two types of projects: 1. Small home repair and yard work, which relies solely on village volunteers and requires only that the home owners purchase the supplies (door knob to be replaced or grab bar to install). 2. Large home repair and modification projects, which typically run at $20,000 a project, are funded by Habitat for Humanity Metro Maryland or Rebuilding Together, who receive grants from County and foundations. Each project can be referred by any participating entity and people can self-refer. Each project is assigned a lead from Habitat/Rebuilding Together and a liaison from the village. The coalition meets monthly to discuss progress, identify challenges, resolve problems, and generally use a shared learning model to build a strong work process. We also discuss communication barriers and ways to address them. Details on older people's involvement: Villages are volunteer-based organizations predominantly run by older adults. They are a key partner in this project. They are the ones that perform the smaller home repairs, refer people who need the larger projects as well as serve as liaison to the coalition. Without villages, this project is not viable. 1. Positive: People did not know they could get so much help from local community organizations and are now much less isolated. 2. Villages gained new appreciation to the importance of assessing their members homes not just their person. 3. Villages also learned about the challenge of home maintenance for older adults who are not wealthy and the barriers in peoples' mind about home modification. 4. Habitat for Humanity and Rebuilding Together are gaining better understanding of the older adults needs and how to serve them better. 5. Communities can use this project as a fulcrum for revitalization. 6. It is not easy to convince someone their home should be more accessible. People do not like change. 7. Trusting relationships are key to success. Both among coalition members and between the coalition and the people we serve. Habitat for Humanity surveys the home owners after a project is complete. They report home owners felt overwhelmingly positive about this project and were happy to share their stories with others in the community. 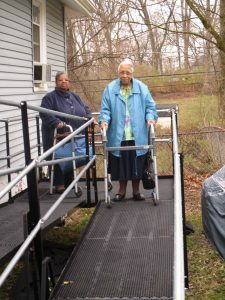 Some of the homeowners we served have been unable to get out of their homes due to lack of accessibility of the home. Please find an interview Village of Takoma Park did with one family in the attached newsletter. We plan to expand our coalition’s work to other parts of the County where villages are able to partner with us. Each new village will add to the coalition capacity since they will be providing their volunteers time and skills. The coalition also established a financial sustainability committee whose task it is to identify additional sources of support. The coalition's first challenge was self-learning. We began with too much enthusiasm and very soon realized we needed to step back first and learn about each other's organization, work processes and culture. We had to understand how the culture we come from affects our ability to work effectively with one another. The first year was dedicated to what we called "self-learning". This proved invaluable when we began taking on the first few projects. 1. Finding and engaging the home owners: People were reluctant to come forward and ask for this service. Some were in denial about their lack of ability to navigate their homes, others did not trust the coalition, others yet were too sick to go through with the process. To solve this, we took a deep breath and stepped back. We let the villages build trusting relationships with the home owners before starting the project. 2. Communications: We have several partners and it was difficult to establish communication channels. To solve that we spent a few meetings creating work flows that were reviewed and approved by everyone. 3. Change in staff: One organization underwent significant internal changes. We had to scale back some of the plans and give them time to reposition themselves.